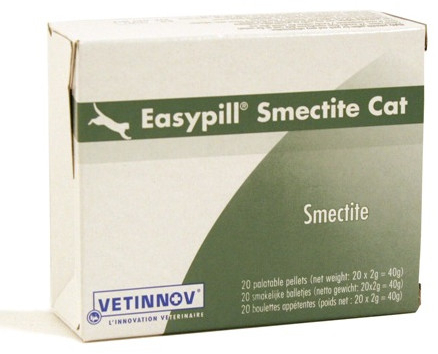 Easypill Smectite is a green clay which has exceptional toxin absorption power that physically supports the mucous membrane in the intestinal tract. Contains high quality protein, digestible fibers, electrolytes and bentonite which helps to reduce intestinal disorders. Available in pellet form for cats and divisible bars for dogs. chloride (2%), sodium chloride (1,5%). Dog Bars - Micronized chicken meal, glycerin, monopropylene glycol, pregelatinized rice starch, pork-by product, duck fat, potassium chloride (2%), sodium chloride (1,5%). Preservatives, antioxidants, binder: 1m558 – Bentonite (285 000mg/kg). Cat Pellets - Crude protein: 13.4%, crude fat: 6.6%, crude fibre: 1.2%, crude ash: 29.3%, moisture: 27.8%, sodium: 0.9%, potassium: 1.14%. Dog Bars - Crude proteins: 14%, crude fat: 6.5%, crude fibre: 0.5%, crude ash: 28.7%, moisture: 29.1%, sodium : 0.7%, potassium: 1.14%. Cat Pellets - 7.366MJ/Kg (176kcal/100g). Cat Pellets - 2 pellets twice a day for 5 days. Dog Bars - 1 portion per 12kg twice a day for 5 days. 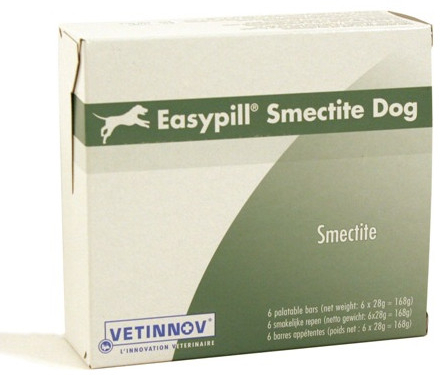 There are currently no questions for Easypill Smectite for Dogs & Cats - be the first to ask one!